Our sales awards are a collection of awards traditionally used for the sales force in your company. These are the employee that bring in the new revenue and business. Recognize them with an award to show them how important they are to your companies success. The large personalization area of this exquisite crystal oval is framed by diamond cut facets that reflect light and color throughout the piece. Mounted to a black crystal base that could also be personalized, this crystal is the highest expression of achievement and recognition. This premier crystal is packaged in a velvet lined gift box for added elegance. 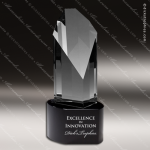 An Elegant Crystal Rectangle Award with Black Crystal Trim makes an excellent employee recognition award, achievement award, sales award or customer appreciation award. Personalized with the message of your choice, it will surely become a treasured keepsake for the recipient. Imagine the expression of the person when they see their name on one of these impressive awards. Engraving is laser etched and a velvet lined presentation gift box is included. 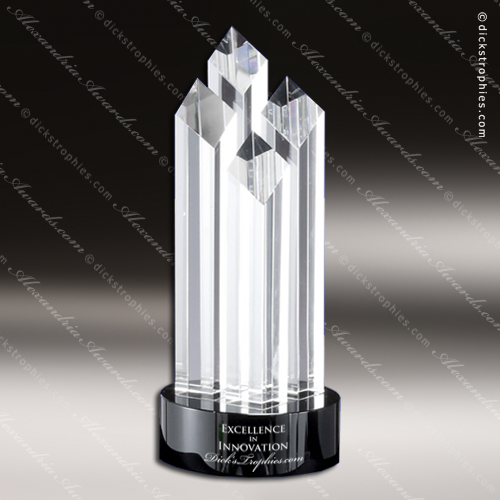 An Elegant Multi Faceted Clear Crystal Award mounted on Black Base. Personalized with the message of your choice, it will surely become a treasured keepsake for the recipient. Imagine the expression of the person when they see their name on one of these impressive awards. Engraving is laser etched and a velvet lined presentation gift box is included. An Elegant Four Tower Clear Crystal Award on Black Base. Personalized with the message of your choice, it will surely become a treasured keepsake for the recipient. Imagine the expression of the person when they see their name on one of these impressive awards. Engraving is laser etched and a velvet lined presentation gift box is included. 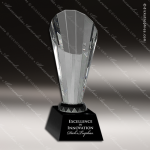 An Elegant Vertical Faceted Clear Crystal Award on Black Base. Personalized with the message of your choice, it will surely become a treasured keepsake for the recipient. Imagine the expression of the person when they see their name on one of these impressive awards. Engraving is laser etched and a velvet lined presentation gift box is included. An Elegant Clear Crystal Star on Black Base. Personalized with the message of your choice, it will surely become a treasured keepsake for the recipient. Imagine the expression of the person when they see their name on one of these impressive awards. Engraving is laser etched and a velvet lined presentation gift box is included. Elegant and Tall Crystal Star on Clear Crystal Tower with Black Crystal Base. Personalized with the message of your choice, it will surely become a treasured keepsake for the recipient. Imagine the expression of the person when they see their name on one of these impressive awards. Engraving is laser etched and a velvet lined presentation gift box is included. Elegant and Tall Crystal Glass Star on Clear Crystal Tower with Black Crystal Base. Personalized with the message of your choice, it will surely become a treasured keepsake for the recipient. Imagine the expression of the person when they see their name on one of these impressive awards. Engraving is laser etched and a velvet lined presentation gift box is included.